Morthal is a town shrouded in mystery. 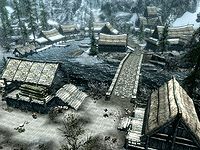 Its people are reclusive and wary of newcomers, and only a single lumber camp supports its weak economy. 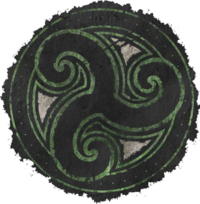 The Jarl is among the most relaxed in Skyrim when it comes to taxation, and as such Hjaalmarch is also the poorest of the nine Holds. The Hold is still part of the Empire, but the Jarl Idgrod Ravencrone is unapologetically vague in her enthusiasm for the Imperial Legate stationed in her dwelling. A number of the people in the town are concerned about the prospect of war. War brings outsiders, and outsiders are not a welcome sight in Morthal. Most would rather the conflict were kept outside their home, leaving them free to pursue their own interests. Just outside of town to the southeast, a Nordic barrow can be found, guarded by a leveled skeleton. Inside, a copy of the Illusion skill book The Black Arts On Trial rests atop a shelf. To the left, the body of a novice conjurer with a dagger in his chest can be found in front of an open tomb, next to a table with a Scroll of Turn Lesser Undead on top of it. Esta página foi modificada pela última vez à(s) 00h35min de 27 de dezembro de 2015.